I am often asked if there is a correlation between serotonin and pulling hair out or between serotonin and the urge to pull hair out. 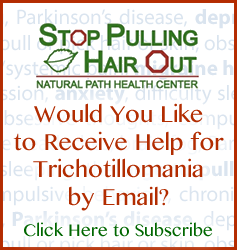 This question usually stems from the fact that most of the medications prescribed to those with trichotillomania are selective serotonin reuptake inhibitors (SSRIs), which prevent the reuptake of serotonin into the presynaptic neuron. This has the short-term effect of tricking the body into thinking that there is more serotonin available; however, the long term effect is depletion of serotonin reserves and ultimately further neurotransmitter imbalance. The answer to the question of whether serotonin is related to pulling hair out for most people with trichotillomania is ‘yes’ but with a caveat. That caveat is that serotonin is just one of the neurotransmitters involved in the urge to pull hair out and/or pulling hair out. The real key to eliminating the urge to pull is to achieving optimal neurotransmitter function, and that usually means finding the correct balance between two neurotransmitters that work together as a team: serotonin and dopamine. Serotonin and dopamine are each made from specific amino acids through a series of steps that require specific nutrients called cofactors. Picture used with permission from Marty Hinz, MD. Achieving proper neurotransmitter function (which eliminates symptoms of imbalance, including the urge to pull hair out and pulling hair out) usually involves (a) raising serotonin and/or dopamine levels to optimal levels and (b) achieving the proper balance between serotonin and dopamine. Sometimes, this process is very straightforward; most of the time, it involves some specialized testing and alterations in the recommended amino acids and cofactors needed to achieve proper neurotransmitter balance. For more information about the correlation between serotonin and pulling hair out and/or why it is so important to achieve proper neurotransmitter balance when trying to eliminate the urges to pull, check out this link: http://amino-acid-therapy.com/neurotransmitters/proper-neurotransmitter-balance/.